Betty Hutton died this week at the age of 86. It wasn't even a month ago that I was jumping around Vinny, doing my best Betty Hutton impression singing "I love you! A bushel and a peck! A bushel and a peck and it beats me all to heck... beats me all to heck how I'll ever tend the farm - ever tend the farm when I wanna keep my arm ABOUUUUTTT YOUUUUUUUU! ABOUUUUTTT YOUUUUUUU!!!" Vinny just looked at me, let me finish my jumping about and singing (which, though odd behavior, didn't stop me from doing the entire song) and then said, "I had no idea there were words to that song. Why do you know all of them?" Which started a whole litany of ARE YOU KIDDING ME?!? OF COURSE THERE ARE WORDS TO THAT SONG!! THAT IS BETTY HUTTON! SHE IS SO FUNNY! SHE IS SO HILARIOUS! LET'S GO WATCH STAR SPANGLED RHYTHM RIGHT NOW!!!!! 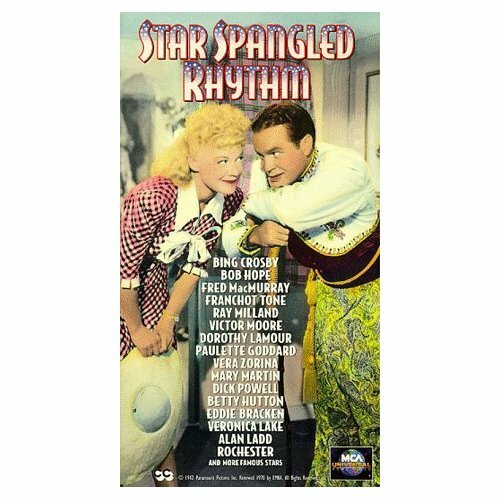 See, years ago, a friend of mine introduced me to what has now become one of my top ten favorite films: Star Spangled Rhythm. It's not the *best* movie in the world - you can tell that they sort of threw it together quickly as a love note from Paramount for the boys away from home. It's a bunch of skits and songs and stars cobbled together with a somewhat weak story line to explain all of the performances - but thankfully, that story line features Betty Hutton. I fell in love with her instantly. Naturally, she can sing and dance like all the great musical stars of that era - but for me, it's her timing , physical comedy and oh! those voices! I laugh every time she sticks a tissue in her mouth becoming the upper crust secretary to the head of Paramount studios. Not to mention - always funny: the scene where she is trying to scale the studio walls. So I'm off to have my own tribute to Betty today. I'll play some of her records, and tonight I'll see if I can rope some friends into watching Star Spangled Rhythm or My Favorite Blonde with me. I'll lure them in with the promise of homemade spinach artichoke dip and pecan crackies. If nobody bites, I'll watch them by myself, laugh at all the funny parts again, sing all the songs, and yell "YOU FORGOT TO MARRY ME!" at the top of my lungs. Edited to add: PEOPLE! I KNOW it is "hug around the neck" I WAS SINGING THE SECOND VERSE OF THE SONG!! The one about Chickens going to the Dickens!! SHEEEESH! !